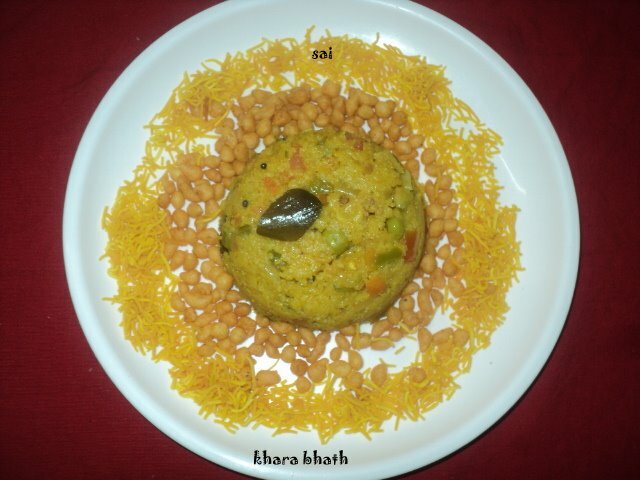 Its been sometime since I shared anything under the label Breakfast.I had this picture in one of my albums and thought of sharing it.Khara bhaath is the Karnataka special dish which is very famous in Bangalore side.I adapted this recipe from The chef and her kitchen.I had prepared this long back and had liked it very much.Khara bhaath is similar to that of vegetable rulam or upma.Few variations are done with different names.Usually it is paired with sheera(sweet dish)and popularly known as chowchow baath and is served in most of the functions…For Vegetable rulam refer here. Dry roast the rawa until you get a nice aroma and keep it aside. Heat 3 tbsp ghee and roast cashewnuts until light brown in colour and keep it aside. In the same pan and ghee,splutter mustard seeds,add all the seasonings mentioned,fry it until light brown in colour,add green chillies,curry leaves. Add onions and saute it for sometime. Add all the veggies and cook it until it fades little bit. Add all the spice powders and saute for a second. Now add 4 cups of boiling water and again take a boil. Add semolina,salt to taste,pinch of sugar and cook it stirring well. Close the lid and keep it for 2-3 minutes. Off the flame and garnish coriander leaves,roasted cashewnuts,grated coconut and lime juice. Serve it hot with a blob of ghee.